Clarence Alcordo, a lawyer and a Certified Public Accountant (CPA), is the Legal Compliance Director of Kittelson & Carpo Consulting. She currently leads the company’s Legal Compliance Department and assists local and foreign investors in forming and registering their businesses in the Philippines. She is in charge of facilitating and monitoring the progress of projects coordinated with various government agencies to accomplish requirements for incorporation, business registration, and other related services. She also handles the legal compliance obligations of corporations after successful registration. 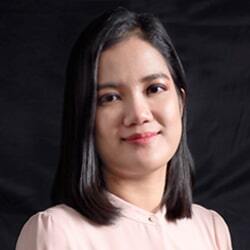 She initially practiced her accounting profession in 2009 in the Business Support Services Department of Punongbayan and Araullo – the member firm of Grant Thornton International in the Philippines. Prior to joining K&C in 2014, she gained significant knowledge and experience in preparing financial statements and government tax compliance while working in Ayala Theatres Management, Inc. – a 100% fully-owned subsidiary of Ayala Land, Inc.
She obtained her degree in Bachelor of Science in Accountancy from the Polytechnic University of the Philippines – Main Campus in 2008 and passed the CPA Licensure Examination in the same year. She earned her law degree from San Beda University College of Law – Manila in 2016 and passed the November 2016 Bar Examination thereafter.